MISSION, KS--(Marketwire - January 31, 2011) - (Family Features) Many Americans follow a gluten free diet in their daily lives. In fact, retail sales for gluten free products nearly tripled from 2004 to 2009 reaching almost $1.7 billion. That number is estimated to top $2.6 billion in sales by the year 2012, according to Packaged Facts. "Families are looking for wholesome, nutritious solutions that are gluten free and convenient but still taste great," said Keri Glassman, registered dietitian and author. "Gluten free foods can fit into a busy lifestyle, without making mealtime sacrifices. Chex® cereal is one of my top picks, and I recommend it as a good breakfast choice to many of my clients with gluten restrictions." Glassman noted that Wheat Chex and Multibran Chex are not gluten free and advises to always check package labeling and ingredient panels to confirm whether a product is gluten free. Start the Day Right -- Eating breakfast lays a good foundation for the day. A nutritious breakfast should contain whole grains, low-fat dairy, lean protein such as egg whites or peanut butter, and a serving of fruit. 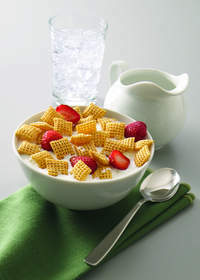 Chex cereals offer at least 8 grams of whole grain in every serving and pair perfectly with fruit such as bananas and blueberries, not to mention milk. Stock Up -- Keep the kitchen stocked with delicious options that are naturally gluten free, such as fruits, vegetables, cheese and most yogurts. Simple Snacking -- Nutrient-rich snacks can be part of a complete and healthy diet while helping to keep cravings at bay. Keep single servings of raw or dry-roasted nuts and crunchy gluten free cereal in your bag for an on-the-go option. Keep a Food Journal -- Glassman recommends keeping a food journal to track meals and snacks throughout the day to ensure you're meeting your daily nutritional needs, including recommended servings of grains, fruits, vegetables and protein. Jot down what works well and what doesn't so you have a point of reference. Recipe Round-Up -- Mix up your mealtime by testing delicious gluten free recipes the whole family will appreciate. An array of gluten free recipes is available at www.Chex.com/glutenfree and www.LiveGlutenFreely.com.